It matters immensely who leads a nation, particularly in periods of major transformation, when long dormant tensions or trends assert themselves and begin to reshape political discourse. The chronicles of history are filled with tales of leaders who rose to the occasion under these circumstances and redefined the destiny of their countries, as well as those who were overcome and ultimately felled by events. The world today is facing a backlash against globalization; an unsettling of the liberal democratic order that has prevailed since the end of the Second World War; the rise of populist and nationalist politics; and an emerging challenge by China to the world leadership of the United States. The signs of those changes are playing out loudly in the US and Europe, where nationalist, anti-immigrant and anti-globalist politicians are challenging long-held assumptions and beginning to rock the foundations of existing political and governance structures. In Asia too, leaders are facing a raft of new challenges, seeking to come to terms with rapidly changing domestic circumstances while also navigating potential tectonic shifts in the international order. 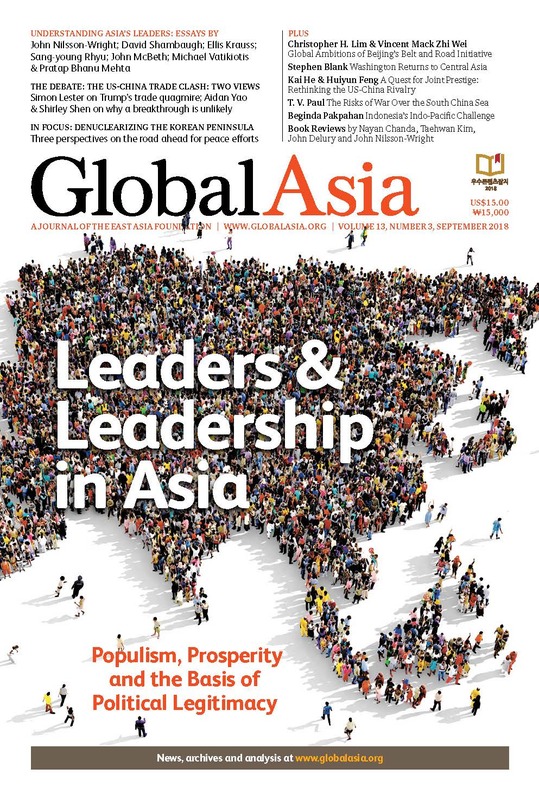 In the cover package of this issue of Global Asia, we examine the rise of populism and identity politics, particularly in the US and Europe, and then profile the leaders of a number of key Asian countries to explore how they are managing these emerging forces and other domestic challenges. The fact that almost all of these countries are democracies only underscores the vulnerability of these leaders to popular opinion. But even in China, leaders are keenly aware of the volatile nature of popular opinion, particularly nationalist sentiments. Elsewhere in this issue of Global Asia, our Features section includes a detailed account of China’s Belt and Road Initiative and how it aims to forge an international vision of President Xi Jinping’s “Chinese Dream;” a look at how and why the Trump Administration is placing greater emphasis on Central Asia, which Washington has long neglected; an essay on how the US and China could mitigate the negative aspects of their great power rivalry and achieve greater opportunities for cooperation; an examination of the risks of war over disputed claims in the South China Sea and why that could prove so costly; and finally, why Indonesia should step up to a leadership role in the Indo-Pacific region. Our In Focus section dissects the aftermath of the summit diplomacy with North Korea earlier this year and explores the hard challenges ahead to achieve denuclearization. It also raises the intriguing question of whether Trump’s summit with Kim Jong Un was really aimed at buying time to focus on the US standoff with Iran. In our Debate section, meanwhile, we present two views on the emerging trade war between the US and China, both of them suggesting a trade war is ultimately a bad idea for everyone. As always, we also feature reviews of some of the best recent books on Asia. As the growing backlash against globalization picks up pace, populists and nationalists are on the march, particularly in the US and Europe. Leaders in Asia can hardly escape this growing trend, even as they grapple with their own emerging domestic challenges and the evolving transformation in the regional order. We profile some of Asia’s key leaders and the mark they are making. Conventional explanations for the recent rise of populism and identity politics are too narrow. All Xi, All the Time: Can China’s President Live Up to His Own Top Billing? The Chinese president is convinced that leadership from the top must be strengthened. The Japanese prime minister’s challenges mount, including an erratic US and his desire to amend Japan’s constitution. A wakeup call is needed after an erosion of the president’s popular mandate amid sputtering economic policies. The increasing influence of Islamist issues has pushed the president to accommodate conservative Islamic parties. Personal vulgarity and glorification of violence haven’t undermined his rule, but is Philippine democracy suffering? The specter of Hindu nationalism has emerged as a potent force that could threaten the country’s democracy. US President Donald Trump is leading his country into a trade quagmire. Growing hostility towards China will be hard to pull back from. The prospect of trade talks restarting between the US and China is unlikely to lead to a major breakthrough. The BRI is a central component of Beijing’s agenda to cement its leadership in the world. The US under Donald Trump is taking renewed interest and seeking to boost its regional influence along with allies such as Japan and India. Washington and Beijing should work together to promote shared leadership to achieve greater co-operation among all nations. As China rises, how likely is it that disputes over this key body of water could lead to conflict with the US? Indonesia and other ASEAN states could play a key role in mitigating US-China rivalry. Was Trump’s true Singapore summit agenda to cool tensions to gain space for a harsher policy on Iran? Why peace efforts shouldn’t focus exclusively on denuclearization. Wherever it leads, the road to peace will be long and hard. Tansen Sen’s India, China and the World: A Connected History highlights lesser-known links between the two countries.